2. the vertical axis offering a screw retained selectable angle from 0 – 36˚in respect of the body of the dental implant. The abutment connection can be chosen for the specific implant internal connection. The aim of the study was to determine the clinical innovation of an adjustable abutment fabricated for dental implantology. The study examines the process of selecting the angular orientation of the abutment for optimal screw retention of the prosthesis at the time of implant placement when the implants were placed optimally for the available supporting bone. 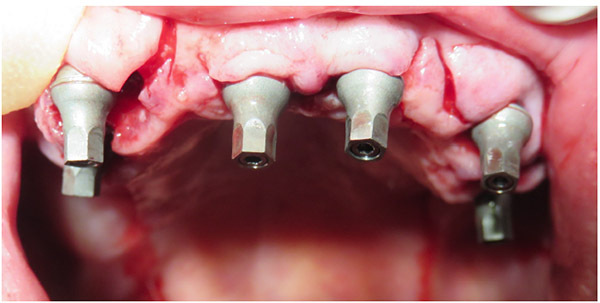 A custom abutment offering a selectable angle for screw retention for internal connection implants was fabricated in grade 5 titanium (Ti-6Al-4V). The first case using the abutments to support an immediate loaded temporary dental arch was performed in 2016. Six implants were placed in the maxilla at divergent angles in areas with maximum bone volume without augmentation. The abutments were connected to the implants and individually aligned for overall parallelism at the time of surgery. An immediate acrylic bridge was polymerised to the screw retained copings of the abutments. The bridge, abutments and implants were assessed over the following 4 months before impressions for definitive restoration. Parallelism of the prosthetic connections was achieved with all of the 6 adjustable abutments. No mechanical failures of the abutments were encountered. Bone levels and soft tissue remained stable following the initial healing phase. All implants were successful. The surgeon can place multiple implants at divergent angles to utilise available bone morphology and volume, avoiding anatomical structures, and achieve parallelism of the adjustable abutments for aesthetic and mechanical connection to the prosthetic structure. Successful fabrication of a 5mm custom abutment offering a 36˚ range of selectable screw retained adjustment is possible. Initial results confirm 100% mechanical integrity of an innovative selectable adjustable abutment.